If you're following these weekly wrestling musings, I'm skipping Survivor Series for the eventual Survivor Series marathon run of musings that I might consider doing in November... because I sure as hell ain't doing another Starrcade run if they're not doing a televised event under the name. But in any event, it's for the best since I'd just want to get 2003 over and done with and... yes, we still have the couple Smackdown PPVs to cover down the line, but that's down the line, not the immediate future. 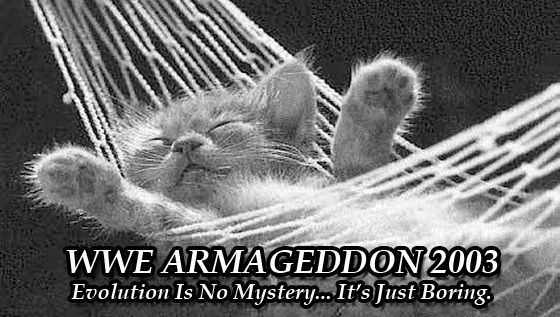 So, let's put a whole through Armageddon 2003 so we never have to revisit this terrible year in wrestling again... unless I lose my mind and end up watching an NWA-TNA PPV from this era. So this PPV took place shortly after U.S. forces discovered former Iraqi leader Saddam Hussein. And this is why Lillian Garcia is singing the National Anthem. Booker T defeated Mark Henry in a nothing match. And I mean nothing match. This didn't go very far; it stemmed from a Survivor Series match. Even so, it's a nothing match that did little for me. Randy Orton defeated Intercontinental champion Rob Van Dam to win the title. Mick Foley was the referee for this match and this would earn him a spit wad from RKO the next night. The match isn't anything special; there's a bit where Foley stops Flair from giving Randy an assist, but other than that, it was fairly straightforward fare. Orton's IC title reign would last a good few months before losing it to Edge at some PPV in 2004. Chris Jericho and Christian defeated Trish Stratus and Lita in an intergender match. Trying to book an intergender match today is almost impossible in squeaky-clean WWE (and no, the Mixed Match Challenge thing from months ago doesn't count) and so this is something unique for better or worse. For what it is, it's not bad and certainly not cringeworthy, but nothing particularly notable. Shawn Michaels defeated Batista in a nifty finish that saw Shawn escape the Batista Bomb and smack Big Dave with some Sweet Chin Music for the pinfall victory. This was pretty much Shawn wrestling a broom to a three-star match and it was fairly entertaining fare. Batista is pissed. So pissed, in fact, that he power bombs both Matt Hardy and Maven, who were scheduled to have a match and now can't because they both have boo-boos and broken. By the way, Maven is the kid who won the first Tough Enough and is perhaps best known for eliminating Undertaker from the 2002 Royal Rumble. Beyond that, he didn't really do much else of note, but considering he stuck around until 200x, he was probably the most accomplished Tough Enough victor until John Hennigan won No. 3. Hennigan is perhaps better known as Johnny Nitro Morrison Mundo Impact... as of this writing, that is. Next up, we have Tag-Team Turmoil, where two tag-teams start off and whoever wins gets to face off against the next team until all is said and done. Reigning RAW Tag-Team champions the Dudley Boyz are the fifth team in the contest and they hold their own until last-minute entrants Ric Flair and Batista came in and beat them for the titles. This was just a bunch of little TV matches combined into one 20+ minute block of action and that's really all there is to be said about the match. And with this match, three-quarters of Evolution are holding gold, which makes the World title match a foregone predictable one. Women's champion Molly Holly defeated Ivory to retain the title. This was a match that happened and that's probably the nicest thing I could say about this one. It's not a bad match perse, but the only reason this exists is to act as a downer between the two "big" matches. Meh, whatever. McSon-In-Law defeated World Champion Goldberg and Kane in a Triple Threat match when McSon-In-Law hit Goldberg in the jackhammer section and pinned the poor guy after giving Kane a pedigree for good measure. Well, give McSon-In-Law credit; he didn't introduce a cattle prod to the match... though I'd imagine that'd be more interesting than what we got. Here's the problem with this match that's pretty much an epidemic with most of these RAW main events; they're too long and too boring. When you have three guys who tend to wrestle more or less the same way, you need something exciting to happen or at the very least, keep it very short. This dragged way too long for an endgame that everyone saw coming a mile away. And so the show ends with all four members of Evolution standing triumphantly on the stage, all of them champions in some form or fashion. And despite the sour note that this show ended on, this is a cool little visual, because it's here where Evolution almost fulfils the promise of being another Horsemen-type unit. It's too bad that Evolution never became as interesting as the Horsemen were in any incarnation. Even a Horsemen incarnation comprising Paul Roma, Mongo McMichael, Sid Vicious, and Kendall Windham managed by Hiro Matsuda and enforced by Kevin Nash dressed up as Arn Anderson would've been more intriguing television than Evolution. 2003 was not a good year for WWE product and while people will say that Smackdown was good during this time, that's not really saying a whole lot since you had the likes of the feuding McMahons, Zack Gowen, and nothing else worth remember beyond whatever Kurt Angle and Brock Lesnar were doing. As for Armageddon, there's little here for me to like. I was bored throughout the show, almost to the point of falling asleep. My mood was so sour throughout the three-hour run that even some of the better stuff (and there is some good stuff to be found here) is overshadowed by the amounts of blistering stupid and ineptitude along the way. And in some ways, that makes Armageddon a nice cap on the year 2003. However, there is one piece of WWE 2003 that I want to touch on before we really call it a year, but I'm holding it off a week and saving next week for something truly special.